Norway rats (scientific name: Rattus norvegicus) are the most typical critters that live in groups close to humans, in and around their houses, particularly in urban areas. 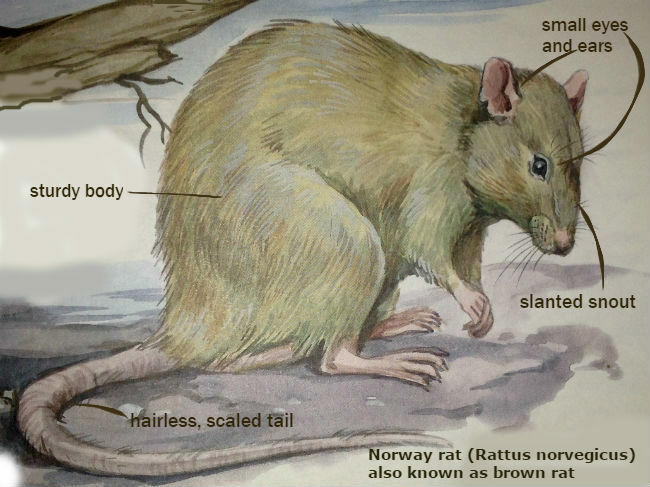 “Brown rat”, “sewer rat”, “wharf rat”, “street rat”, “Hanover rat” and “common rat” are all the synonyms for the Norway or Norwegian rat species. In fact, these rodents originated not from Hanover, Norway, but from the oriental countries of India, Persia and northern China. Nowadays, the Norway rats have spread via carrying trade to all continents except Antarctica. They are known to have traveled from Asia to England less than two centuries ago and to have spread from thence to other countries visited by English cargo ships. The burrowing Norway rat is the most aggressive among other rat species and has almost displaced the arboreal black rat in urban areas. This gray-and-brown rat has already become dominant in Europe, Asia and North America. Brown rats live in large families with strong hierarchical system. On the one hand, they fight cruelly for dominance. On the other hand, they sleep together to keep warm and groom each other. Norway rats are territorial critters and defend their area aggressively. 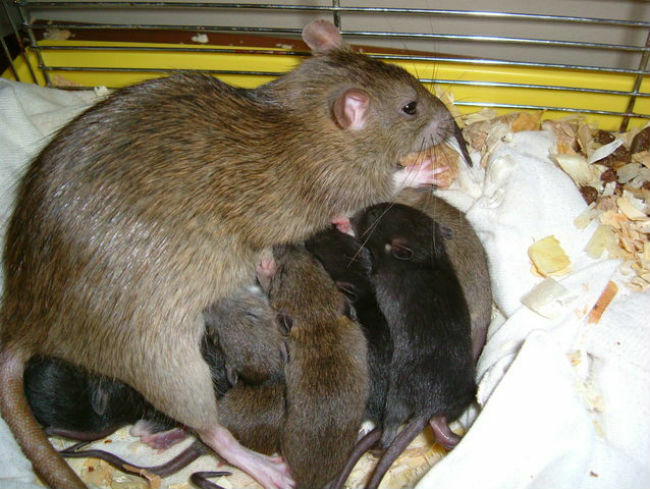 As a rule, several female rats and their young are subordinated to the male rat in a small group. If food is in short supply, or there is something new to feed on, the family members lower in social order are the first to die or to sample. Even in the worst cases, when the most of Norway rats die from chemical extermination or predators, the remaining mature females will quickly restore the previous population level. In fact, the Norway rats are burrowing species. They simply bed in soil in the wild. In rural areas the Hanover rats reside in burrows near ponds, on the riverbanks, in barns, cellars and vegetable stores. In urban areas they may shelter underground, in basements and other subsurface places, such as sewers and cellars. Norway rats are the largest among the common rat species that dwell in urban areas. Adult rats are not so large, they are of the size of a kitten three months old. In practice, an average male rat weighs about 12 oz, and a female rat is about 9 oz. They have small eyes and ears, slanted snouts, and sturdy bodies. You may have heard about exceptionally large brown rats (up to 35 oz) that are as big as cats. In most cases, large Norway rat is misidentified and it is more likely to be a coypu or muskrat. The brown rat is an omnivore. They can feed almost on anything. The burrowing brown rats feed on grains, nuts, seeds, vegetables, and plant materials in forests and on fields. Moreover, birds and their eggs, insects, slugs, snails, mice and fish are on their menu either. Sewer rats consume milk products, meat, sunflower seeds, peanut butter, cereals, pet’s meal and food scraps in houses and barns. The maximum life span of wild burrowing rats is three years. However, most barely manage one. If conditions are favorable, the Norway rats can breed throughout the year. Females are able to produce from 7 to 14 babies. The gestation period is three weeks. They may give up to five litters a year. Rats that reside in human settlements are hazardous vectors of viruses and parasites. They may bring into your home a number of pathogens, which can result in diseases. Norway rats transmit viral hemorrhagic fever, Weil’s disease, cryptosporidiosis, hantavirus pulmonary syndrome, rat bite fever, and Q fever among humans. Selective breeding of albino brown rats has produced the pet rats and the laboratory rats. Fancy rats’ coat can be of different color and style. In fact, they are less aggressive animals than their wild counterparts. White lab rats are model organisms of medical and biological experiments, various psychological tests. Working rats entertain kids in zoos and treat patients in convalescent centers, lay computer link cables. Humans keep domisticated Norway rats in cages. It is easy to train and to take care of the pets. How to feed your fancy rats read here. The Norway rat is nocturnal and gets active at night. They are fast runners, nice diggers, skilled climbers and good surface and underwater swimmers. This helps the Norway rats survive. They can easily reach bird nests in trees, excavate extensive burrow systems and catch fish or other rodents. Norway rats have acute hearing. They are sensitive to ultrasound. However, if you use ultrasonic repellers, rodents soon get used to them. Sewer rats are able to produce ultrasonic vocalizations for communication. Street rats possess a highly developed olfactory sense. In practice, humans train domesticated Norway rats to sniff out gunshot residue, land mines and tuberculosis. Besides, the dwarf rats can feel X-rays by the receptors in brains and avoid the contaminated areas. Moreover, they can withstand high radioactive exposure and survive after explosions. On the other hand, rat’s vision is poor. They are dichromates. It means that they perceive colors rather like a man with red-green colorblindness. They also have UV receptors and may see ultraviolet lights. In addition, Norway rats can see dreams and laugh about something funny the same as humans. To sum up, the Norway rats are clever, cautious animals that are able to make our indoor life miserable. If you have a pest problem at home, you should take measures to get rid of Norway rats by hook or by crook.